So last autumn when I made my first birthday list, one of my hopes for the upcoming year was to "make or find someone to make a youth group t-shirt quilt." 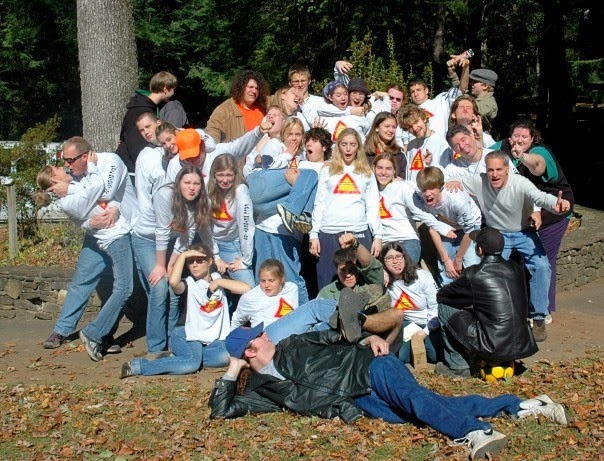 Because if you grew up in youth group like I did, and jumped at the chances to go on fall and spring and summer retreats each year, then you probably ended up with a dresser drawer that could barely shut all the way, thick as it was with cotton youth retreat shirts. Counselors would hand out our new shirts on the last day of a retreat before we packed up the vans and drove home, headed down a mountain in the fall, or away from a beach in the summer. Since each retreat had a theme - Prepare the Way! Agape! Roots! Strong Ties! - the shirt would always mirror it with an illustration or design, along with an important quote or Bible verse from the weekend stamped on it somewhere. Each shirt was different, each one stood out. The day after a retreat, I would always wear my new shirt proudly to school. Not because it had a Bible verse on it, or because it made me "better" than anyone. I simply wore it because it reminded me that I was part of a community. It wrapped me in memories, reminders of love, when the school hallways weren't always as kind. It reminded me that I had a home. Last Thanksgiving, we met up for our regular brunch date, regular in that it happens whenever we're both back home. Afterward, we moseyed back to our cars, and I handed her a garbage bag stretched to the brim with my youth group t-shirts, freshly washed for their new adventure. It would probably take awhile, Kady said, hoisting them into her trunk. She was booked up with wedding gifts to sew until the summer. I could care less, I told her. No time limit for me - just putting them in her care felt good! It felt good not only because I was checking off an item on my list, not only because I knew she would create something beautiful, but because Kady is my youth group friend. She has many of the same shirts, knows where they came from, why they're important to me. She understood. In two weeks, we'll meet up for another Thanksgiving week brunch. And out of her trunk, she'll pull the finished product, splashed with bright colors and a hodgepodge of designs spanning the years, all sewn together with care. A happy new collage of such sacred moments and people in my life. The love I gained in that safe space to grow all those years ago. The love with which Kady crafted and transformed it for a new era. Now, instead of wearing a new shirt to school, I can come home from work and cover myself with a quilt, so many reminders of love, and be grateful all over again. Oh, you wanted to see the finished product? Check it out on Kady's marvelous blog! Can't wait to get my hands on the real thing.